Alexander Waugh's Diary is a sparse but rather good echo of Auberon Waugh's brilliant diary in Private Eye. With more than one entry a year and a bit more of his father's animating bile, the son's diary might also turn into required reading. Alexander, horrible dictu, is an Oxfordian. His claims to have discovered an Oxfordian angle in Covell's Polimanteia (1595) occasioned two responses here and here on Oxfraud. 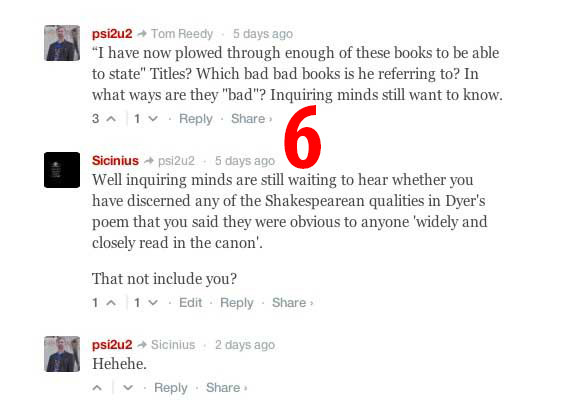 In the 700+ comments on the his diary article on Shakespeare, the usual suspects piled in and the usual mayhem ensued. A discussion of Edward Dyer's poem 'My mind to me a Kingdom is' spontaneously combusted after a day or two. Roger Stritmatter, pontificating on attribution with his usual ersatz authority, unintentionally exposed the weakness of his understanding of Elizabethan poetry. A bit of a disaster, since he claims to be an expert. He expects his opinion on attribution to be heeded. Yet the thread on The Spectator calls any such understanding into question. The opinion of anyone who suspects that this rather average poem, regular of metre and clichéd of thought, is possessed of Shakespearean qualities can safely be disregarded when it comes to the tricky business of attribution based on internal evidence. 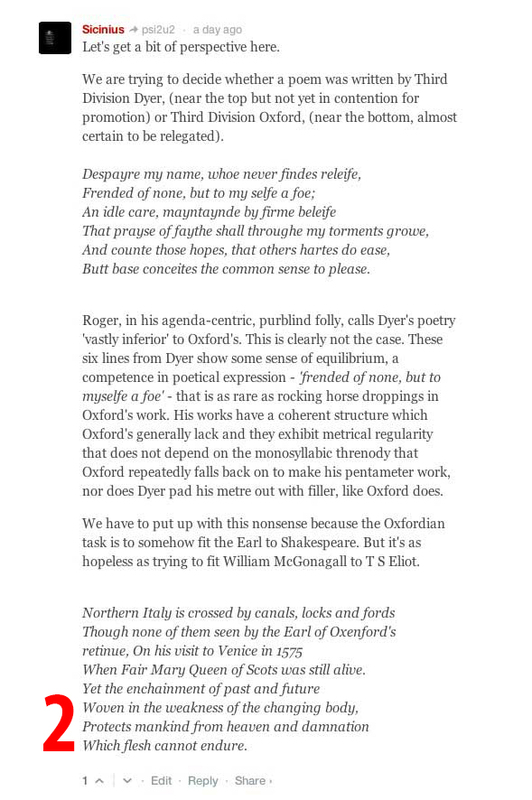 Roger not only states that the poem DOES have Shakespearean qualities, apparent to anyone 'widely and closely read in the canon', he compounds his error of judgement by insisting that Edward Dyer's poetry is 'vastly inferior' to Oxford's. This is a claim any 16-year-old GCSE English schoolboy could be expected to refute convincingly. Unfortunately, he's smart enough to realise that, having dropped himself right in it, continuing the discussion will either lay him open to the accusation that he fails his own test for knowledge of the canon, or that he cannot discern Shakespearean qualities in other Elizabethan poetry. Unkind souls might believe he is incapable on both counts. In other words, Roger's Queen is pinned. If he touches it, he loses it wherever he moves. You would, of course, have to be very unkind indeed to accuse Roger of not being 'closely and widely read in the canon'. He can summon quotes and examples from all over. 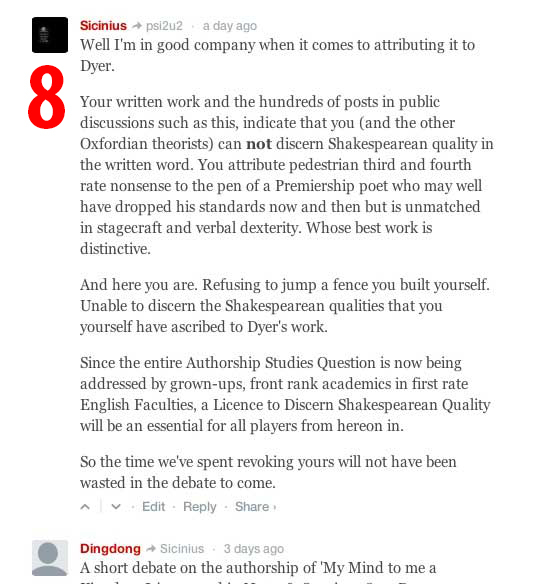 But we are perfectly entitled to question the understanding of anyone who thinks that either Oxford or Dyer can write like Shakespeare. In the Spectator column, we accused him of dodging the issue six times. He said we couldn't count. He was right. Ten was the actual number. We don't expect anyone to read the whole litany of evasion but for the record, each of Roger's dodges is included below. Having ducked the issue in the public debate, Roger wrote what he claimed were ripostes on his own website. He wrote four separate essays, none of which touched on the issue of the poem's connections to Shakespeare. He tried to pretend that instead of a question of Shakespearean quality, that the argument was about the attribution of Dyer's poem. He treated opponents to his full lexicon of insults, using the words 'liar', 'scoundrel' and 'rogue' to describe anyone catching him out in his inadequacy. There was, it's true, a tiny attribution issue in the discussion. May made a tentative attribution in the DNB entry he wrote on Dyer, stating that Oxford has a slightly better claim. Initially, we read the later, equivocal version of May's thoughts and foolishly assumed, from Roger's posts, that May had made an earlier, more positive attribution, so we were a tad surprised to discover that the 1975 version said almost the same thing, citing Oxford's slightly better claim. Out of this tiny molehill, Roger tried to fashion a mountainous, distracting response. What we have here is not, under any circumstances, an argument about attribution. 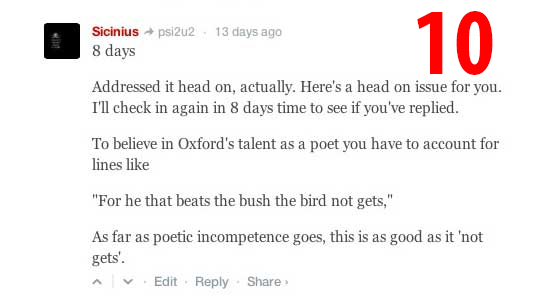 Mediocre as the poem is, we still believe it is too good to be Oxford's. Even were it written by the Earl, May is a poor ally for Oxfordians, and its actual authorship is hardly relevant to the main discussion. 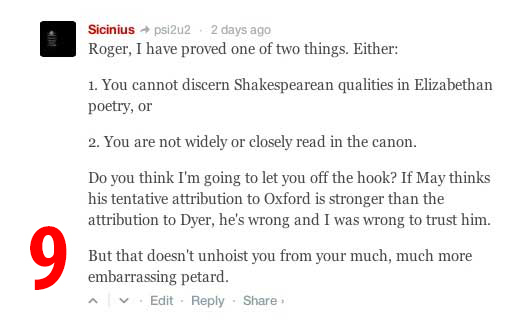 This is an argument about whether Roger the OOTY (Oxfordian of the Year 2013) can discern Shakespearean qualities in Elizabethan verse. In the absence of any evidence to the contrary, after 10 refusals in public and four failures on his own site, it now seems safe to assume that this is beyond him. 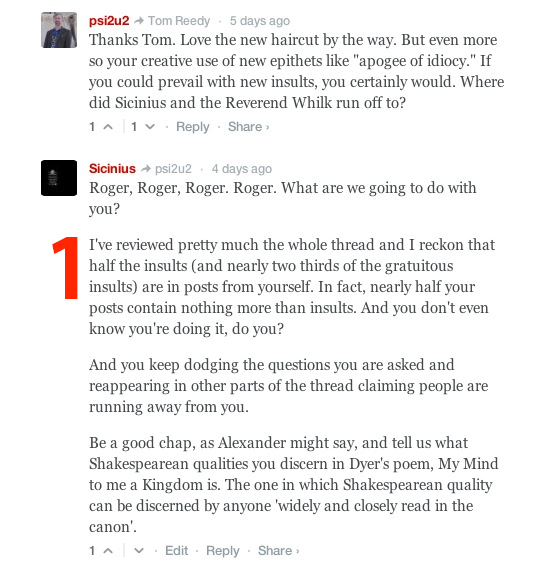 What turns this from a misfortune into a calamity* for Roger is his assertion that the existence of the these Shakespearean qualities ishould be blindingly obvious to anyone as intelligent and well-read as he is. This implies a failure of understanding on all fronts. 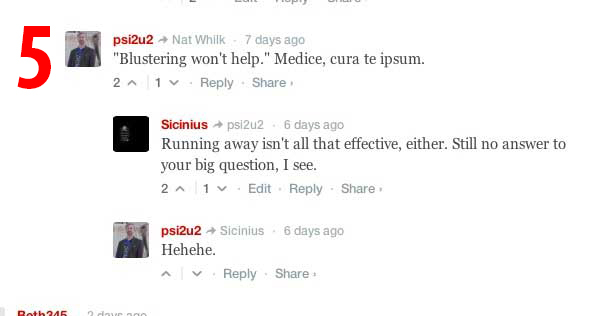 Since replies in The Spectator were unforthcoming, Sicinius replied to Roger on his own site only to be put off again. I’m sorry that you have difficulty waiting, but that’s not my problem. Maybe you need a hobby for which you are better prepared? Or one that does not require you to exhibit the kind of linguistic misbehavior evident in your post here in order to get what you want? Nice, as we jazz fans say. Yet there were more own goals to come. Roger then stated he could not address the issue without more help. "I’ll get back to your concerns about “My Mind to Me a Kingdom” is when I’ve assembled the resources that I need for a complete response". Since the only resource required is a bit of undergraduate study and a knowledge of practical criticism, this is an astonishing admission of incapacity. Sicinius pointed this out and Roger responded by deleting all his posts. Roger's qualifications aside, it's certainly apparent that practical criticism isn't his strong point. 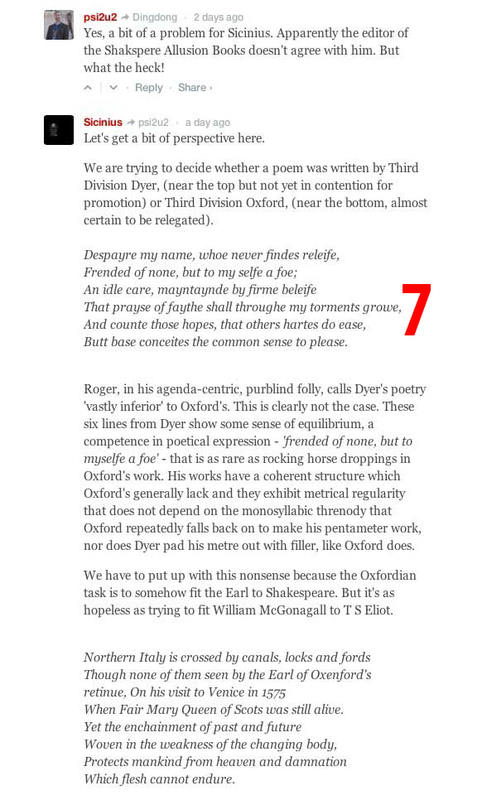 Here's some of Professor May's work on the very subject at hand which takes any guesswork out of how he rates Oxford's ability as a poet. No one outside the rapidly shrinking Oxfordian tent would disagree. 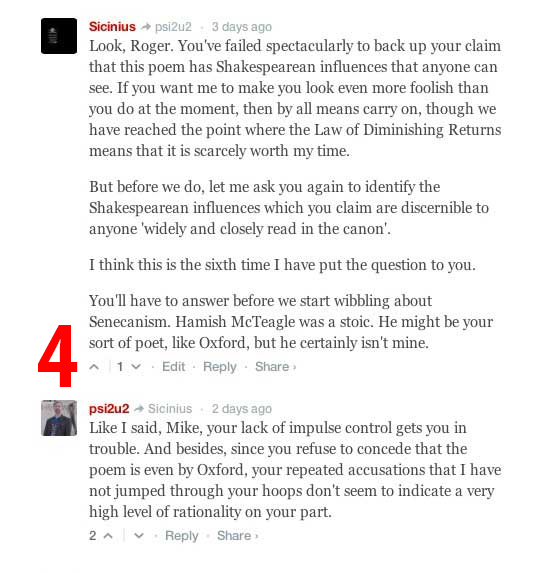 If you've landed here from Waugh's challenge to Sicinius in that column, ask yourself who is more likely to discern a Shakespearean quality. If you're beginning to think that it's been a long time since you read anything sensible by Hopalong, you're not the only one. If you count the original question, below, Roger the Dodger has dodged the issue 11 times now or 15 when rounded up by counting his non-responses on his own site. * Benjamin Disraeli: If Gladstone fell into the Thames, that would be a misfortune; and if anybody pulled him out, that, I suppose, would be a calamity.